Eskimo Kisses goes last to first in the G1 Alabama. Gainesway Stable, Harold Lerner, Andrew Rosen, Nehoc Racing and Magdalena Racing's Eskimo Kisses provided bettors with a 9-1 surprise in Saturday's Grade 1 Alabama Stakes, sneaking up the rail and kicking clear in the lane to win by 6 1/2 lengths. Jockey Jose Ortiz, who won last year's Alabama aboard Elate, followed the instructions of trainer Ken McPeek by staying inside on the sophomore daughter of To Honor and Serve. Ortiz and Eskimo Kisses stopped the clock at 2:03.22 for 1 1/4 miles over Saratoga's fast main track. Steve Asmussen trains both the runner-up and third-place finishers in She's a Julie and 6-5 favorite Midnight Bisou. Indiana Oaks winner Talk Veuve to Me set a very quick pace around the clubhouse turn, turning in fractions of :22.52 and :46.79 while just ahead of She's A Julie and Figarella's Queen. Meanwhile, favorite Midnight Bisou was wide on the course in about sixth position, eight lengths off the lead, and Eskimo Kisses was at the rear of the field. Approaching the far turn, Mike Smith angled Midnight Bisou four wide to make her run while Ortiz kept the strong-moving Eskimo Kisses on the inside, gambling that he'd find a hole. She's A Julie challenged Talk Veuve to me at the head of the lane and took the lead, but it was short-lived as Eskimo Kisses flew up alongside her and easily drew off. Eskimo Kisses kicked clear down the stretch, pulling away toward the wire to win by 6 1/2 lengths, but the battle was on for second between the two Asmussen trainees, She's A Julie and Midnight Bisou. The determined She's A Julie finished just ahead of her favored stablemate. Bred in Kentucky by Gainesway Thoroughbreds, Eskimo Kisses required four starts to break her maiden, and had not won a race since February at Oaklawn Park. The filly did manage to finish second in a pair of graded stakes, then ran fourth in her two most recent starts, both against Grade 1 company in the Kentucky Oaks and CCA Oaks. Overall, Eskimo Kisses has now won three of her 10 starts with four seconds, earning over $700,000. 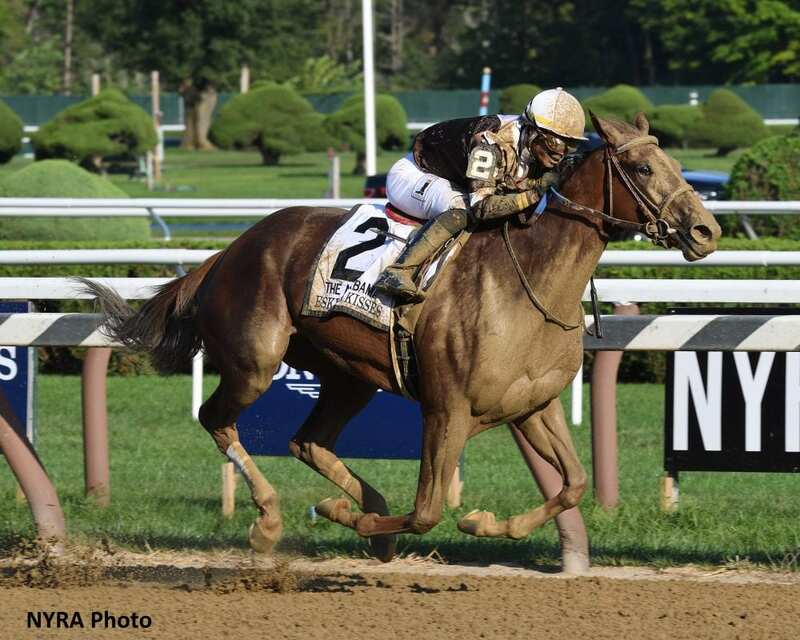 This entry was posted in NL Article, Racing and tagged alabama, elate, eskimo kisses, jose ortiz, ken mcpeek, midnight bisou, mike smith, saratoga, steve asmussen, talk veuve to me by Paulick Report Staff. Bookmark the permalink.